Here comes a free LAN messenger, named SSuite NetVine, for private chat, file, and email sharing. This software is suitable for offices and small organizations connected with the same network (LAN). Instead of using other services that require a server to establish communication and start the conversation, you can take help of this peer to peer messenger. No server required and your chat and files are transferred directly. The only condition is that you and other users must be running this software to establish the connection. The software can automatically detect all the PCs connected on the same network and lets you start the chat or file sharing with any device. Also, a separate window is provided for each individual feature. So, you can chat, share files, and send emails side by side. Where many other similar messengers are limited to provide only chat support, this software looks a really good option. Above you can see its main interface that includes all its features. Note: The software might not run well in Windows 10, but works really well in Windows 7. Download the zip archive of this free LAN messenger and extract it. This is a portable software and you need to ‘run it with administrative privilege‘. After opening the main interface of this software, you have the choice to select and use any feature as per your need. 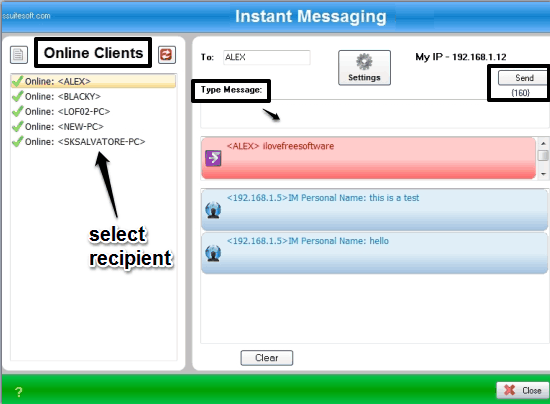 To start instant messaging with other users, make sure they also run this software, and have opened IM feature. After this, the chat window automatically fetches the list of available users on the network. You can also refresh the list. Now select a particular user and enter the message that you want to send. Message length is limited to 160 characters. The other end (receiver) will get your message and can reply to you easily. 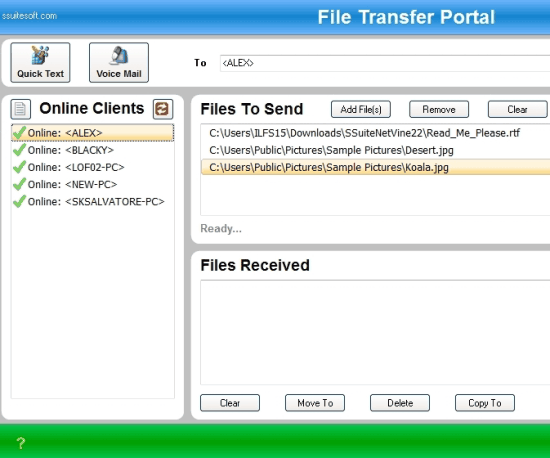 LAN File Transfer feature is also very important in this free LAN messenger. Instead of sending files via emails or using USB Flash drives, you can open File Transfer window of this software and select recipients from the list. Once you have done that, you can add any type of file and share it. This feature also comes with Voice Mail option using which you can record your voice and send it to the receivers. The free Email sharing feature of this software is also very important. It is not just a basic email sharing tool. You can attach pictures, preview an email, adjust formatting, and send emails to all or the selected contacts available on the network. Its self explanatory window makes it really easy for anyone to send and receive the emails. These are the main features presented by this software. 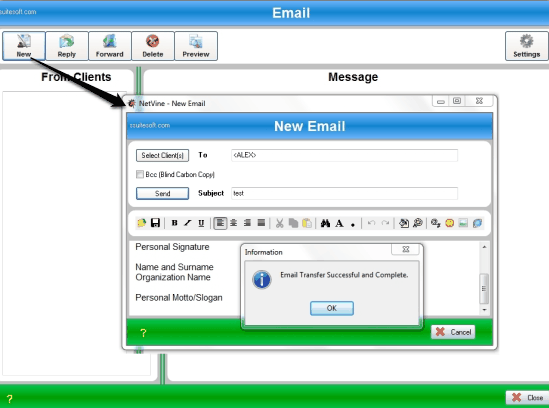 Apart from them, you can also access Inbox window, which shows all the sent and received emails and files. If you are in search for a server-less communication application that can also help you send emails and files, SSuite NetVine is a better choice in comparison to other similar tools. Go for it! Get SSuite NetVine for free.